The Baby Bunch is a support group for breastfeeding mothers sponsored by Wilson Health. The group meets in Room B in the Wilson Professional Building from 10:30 a.m. to noon on the second and fourth Fridays to provide mothers a supportive environment and meet with other moms, ask questions, share ideas and express concerns. The support group is facilitated by a certified lactation consultant with experience in working with new mothers. There is no fee for the support group. 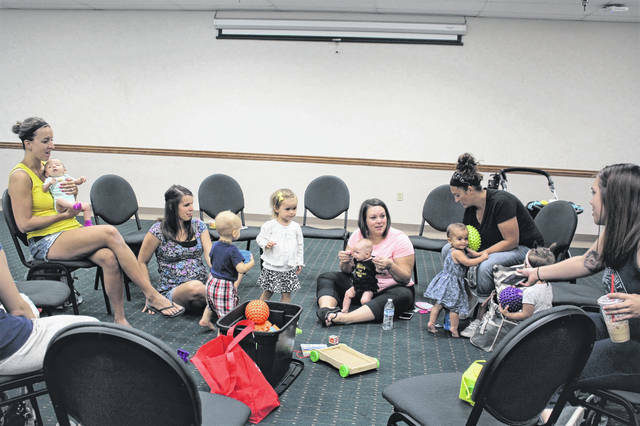 Upcoming meetings include Sept. 14 and 28, Oct. 12 and 26, Nov. 9 and 16 and Dec. 14 and 28.
https://www.sidneydailynews.com/wp-content/uploads/sites/47/2018/08/web1_MomSupportGroup.jpgThe Baby Bunch is a support group for breastfeeding mothers sponsored by Wilson Health. The group meets in Room B in the Wilson Professional Building from 10:30 a.m. to noon on the second and fourth Fridays to provide mothers a supportive environment and meet with other moms, ask questions, share ideas and express concerns. The support group is facilitated by a certified lactation consultant with experience in working with new mothers. There is no fee for the support group. Upcoming meetings include Sept. 14 and 28, Oct. 12 and 26, Nov. 9 and 16 and Dec. 14 and 28.